Valentine’s Day lip balm? This candy-covered holiday is sweet with all kinds of goodie-filled concoctions. 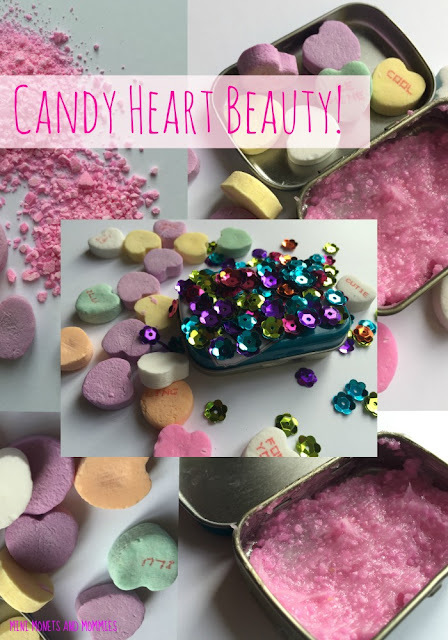 I figured, “Why not make a glossy balm from those cute little candy conversation hearts?” Sounds yummy – right? And, then I got to the first step: Breaking all of those hearts. I tried cutting them (totally not advisable in any way), I tried melting them (it doesn’t work well, and again it is in no way advisable), I tried the cheese grater (nope) and I tried smashing them with the back of a spoon (ok, this one kind of, sort of worked). Even though the spoon smash broke the candy into bits, it was still way too chunky to make a light lip balm out of. You really need more of a very fine powder to make this DIY work. I had spent more time than I care to admit smashing the hearts, and wasn’t ready to give up just yet. 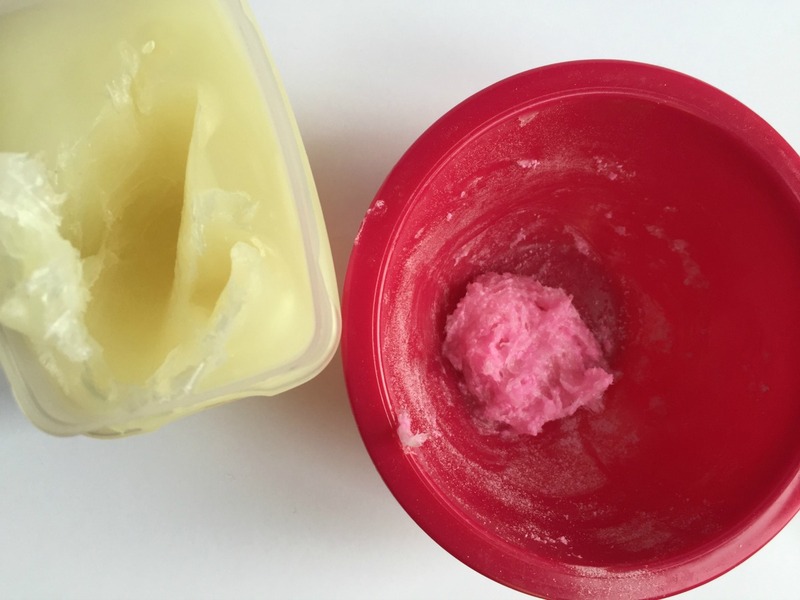 That said, it was entirely clear that a straight out glossy pink heart-made balm wasn’t going to happen. What’s the next best thing? An exfoliating lip treatment! No, you can leave it on your lips – but, it softens, gets the rough skin off and leaves behind a slight sweet scent. And what better for kissing your sweetie on Valentine's Day than super-smooth lips? Indulge yourself with this beauty treat or pamper a special someone with it. 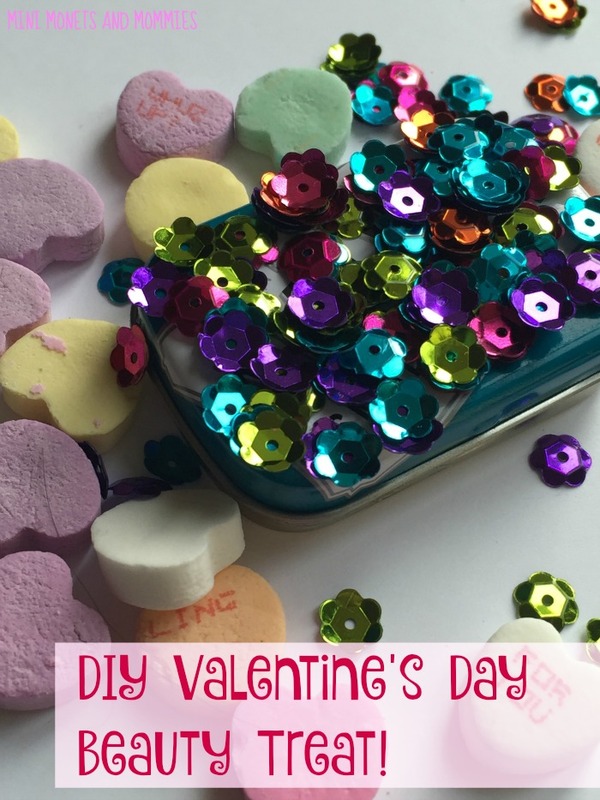 This is a super-easy Valentine’s Day gift for kids to make and give. They can even decorate the container, making it sparkle with holiday love! 1. Break the hearts. I found the easiest way to do this (again, after trying many, many, many different techniques) was to sandwich the hearts in a paper towel and smash them with the back of a spoon. 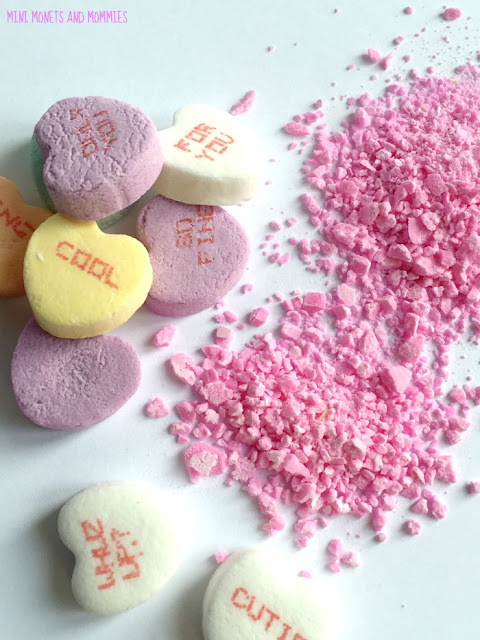 You don’t need to grind the hearts into powder (and, you probably won’t anyway). 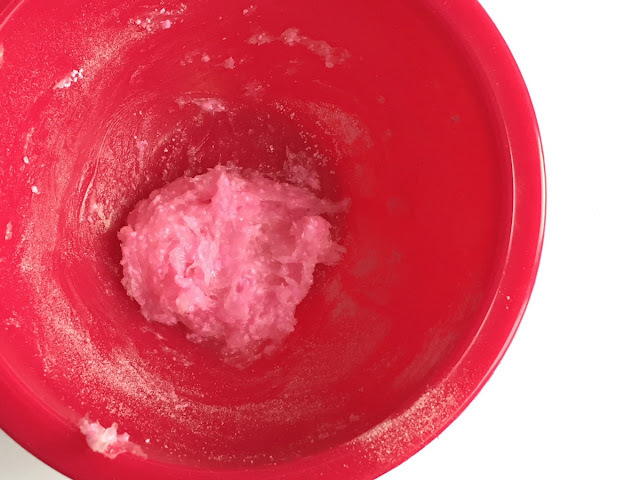 Make small bits, similar to exfoliating beads. 2. 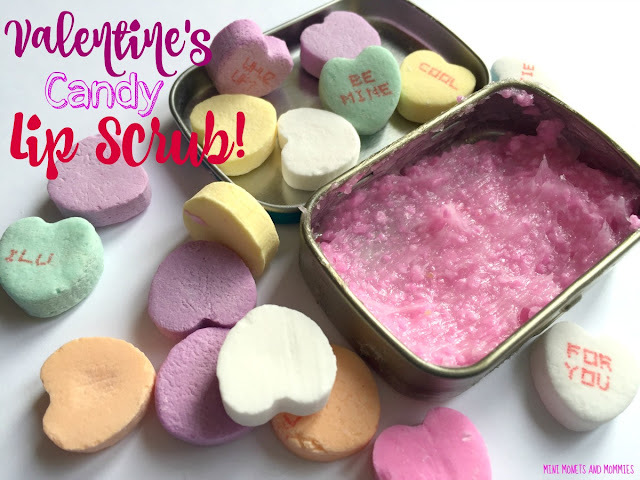 Mix the hearts in a bowl with the petroleum jelly. I used five hearts per two tablespoons of jelly. 3. Spoon the mix into the tin. Make sure to wash the tin out before adding the lip treatment. If you want a slightly minty tingle to it, use a mint tin and skip the washing step. Even though this is a lip beauty treat, you can also get some smooth hands mileage out of it. While mixing I got plenty of the candy-jelly mix on my fingers. The result? Baby soft hands! Are you looking for more Valentine’s Day ideas? 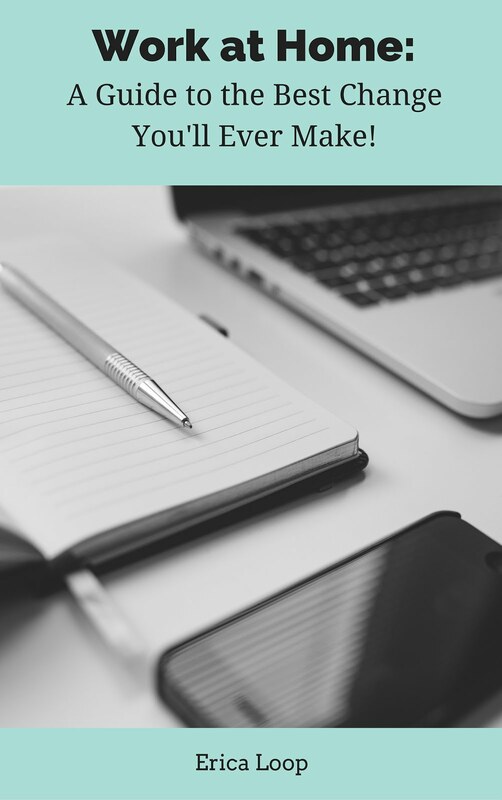 Follow my Pinterest board for activities!